Robert Fulton was born in Newmills. He was the eldest son of Robert and Mary A. Fulton of Tullaghmore, Sherrygroom, Cookstown. He was a member of Newmills Company, Ulster Volunteers. 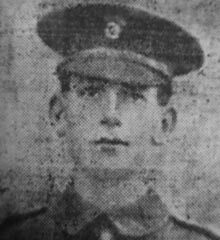 He enlisted with the Royal Inniskilling Fusiliers in Dungannon at the outbreak of the First World War and subsequently transferred to the 16th Battalion Royal Irish Rifles. Robert survived the first day on the Somme but was killed in action on 2nd July 1916. He has no known grave and is commemorated on panels, 15A-15B on the Thiepval Memorial.